The third volume of Charley’s War, written by Pat Mills, continues with the Battle for Passchendaele. Charley Bourne, the main character in this comic, is now working as a stretcher bearer in order to make up for the fact he served on an execution squad. He is now hoping to save lives rather than take them. Because there were so many injured soldiers, the medical officers would often work around-the-clock. There was also a shortage on morphine, which made it very valuable. Charley discovered many things while doing his duty, such as noticing fellow stretcher bearers stealing items off of the dead soldiers, which was strictly forbidden. Even though he never stole anything, he took money from a dying man who begged him to take his savings so that the money could actually be used for something, as the man knew that he would not be able to spend it himself. Charley took the money hoping to give it to the man’s next of kin, but instead was accused of stealing it. This eventually led to him being dismissed as a stretcher bearer. There are many new challenges for Charley in this volume, not only with the war, but with his personal life as well, allowing the reader to feel as though they are truly a part of Charley’s life. This comic does a great job of accurately portraying how things were for soldiers back in World War I. Some of the men developed shell shock due to all the gun fire. Some couldn’t stop trembling, while others became deaf and dumb. This wasn’t that well known back then, so many times the medical officers would misdiagnose them. Something new that medical officers were doing during the war were blood transfusions. Thinking that most people were universal donors, they would do direct blood transfers from one man to another, in hopes of saving lives. Once the donor fainted, the medical officer would stop the transfusion. One troubling scene was with a man named Jack, whose father owned a shop that made bullets. Jack ended up being shot and killed by one of the bullets his father’s company had made. The illustrations by Joe Colquhoun are astounding! His attention to detail is exquisite and it amazes me how he can get so much into such a small space. He shows the war as it really is, allowing the reader to see the terror of the war, and how badly hurt the soldiers would become. Each page draws the reader in and almost makes you feel like you are there fighting alongside these men. One of my favorite parts in this volume is when the last man that Charley saved as a stretcher bearer came back to the tour of war memorials as an old man, hoping to find out whatever happened to Charley Bourne. The illustrations are breathtaking and it is a touching scene. I recommend this comic to anyone who is a history buff or who enjoys war stories. 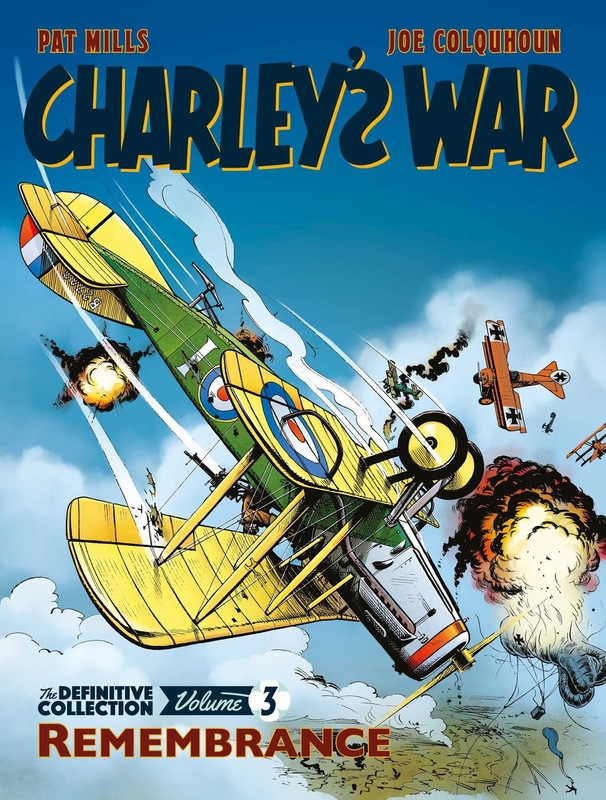 Charley’s War Volume 3 is available June 14, 2018.